#FreshYoGoalCelebration Dance Moment Video Contest. Who's your favourite footballer of all time? 1. Make a video recreating his goal celebration dance/moment and upload here 👉https://goo.gl/XmZjqZ for a chance to win. 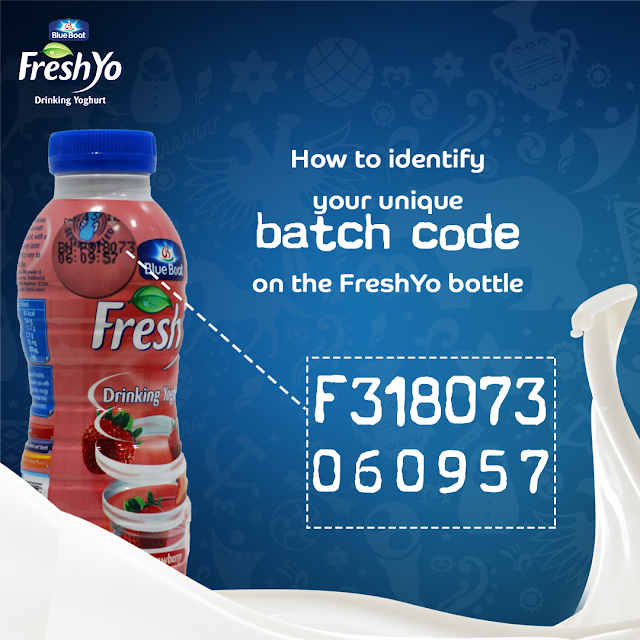 A customized Nigerian Jersey and Three months supply of FreshYo. Click here 👉 https://bit.ly/2MlM3tL for more information and T&C. The activity will begin on the 14th June and end on 30th of June, 2018. For Goal celebrations, visit https://www.facebook.com/BlueBoatFreshYo and click on the #FreshYoGoalCelebration app. Upload your video entry on the upload box. The video must visibly have FreshYo bottle in it. All approved entries will be available on www.facebook.com/blueboatfreshyo and other BlueBoat FreshYo’s pages for public viewing. Submission will be open for five days. After submissions close, there will be two days of voting, after which top 15 entries overall will be rewarded. Images and/or videos of prize presentation to the winners will be posted across all Blue Boat FreshYo’s social media platforms. For Naija Trivia, on the days of Nigeria’s games, there will be 5 trivia questions on Blue Boat FreshYo’s Instagram page every hour for five hours leading up to the hour of the game - 16th, 22nd and 26th of June. Naija Trivia - a total of a total of 15 participants will be contacted and rewarded. Every hour during the Trivia engagement, first participant to get the answer correctly will receive a customized Nigeria Jersey. All entries upon receipt shall become the exclusive property of Caraway Africa Nigeria Ltd. Submission of entries by participants constitutes permission for Caraway Africa Nigeria Ltd to use submitted entries for editorial, advertising or promotional, research and profiling purposes without further compensation or liability. The Promoter shall have the right to change or terminate the activity immediately and without notice. In the event of such change or termination, all participants agree to waive any rights that they have in respect of this activity and acknowledge that they will have no recourse against the Promoter or its agents. 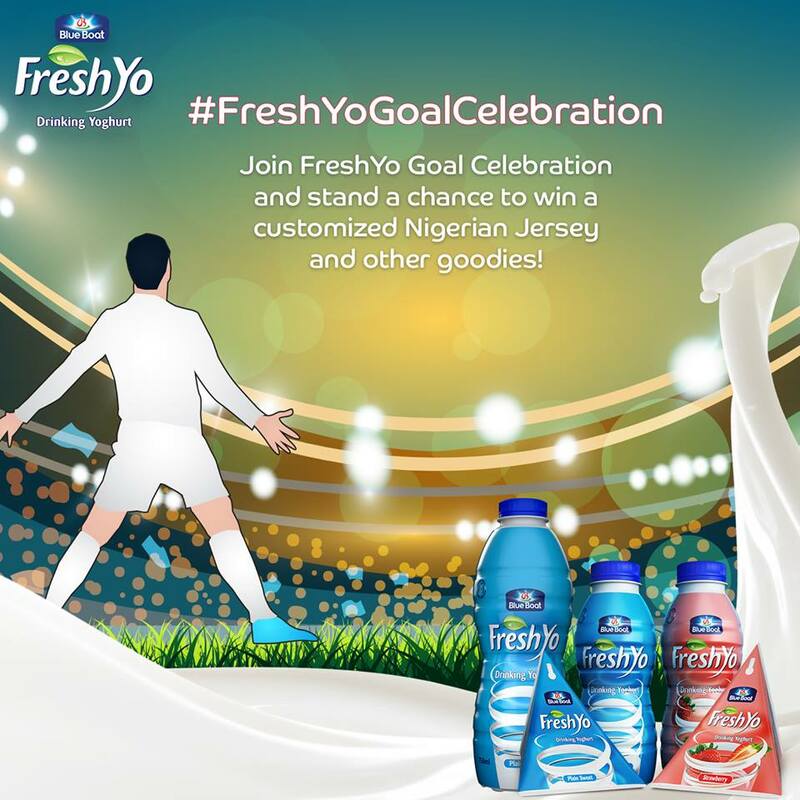 The FreshYo #FreshYoGoalCelebration platform shall not be used for any unlawful, illegal, obscene or abusive purpose. The Promoter has the right to use any material submitted for the purpose of this activity for marketing purposes. Any questions, complaints or comments about the activity can be made in writing and sent as an inbox message to the Blue Boat FreshYo Facebook page. By submitting your entry, it means that you have agreed to the above terms and conditions of the #FreshYoGoalCelebration activity.